In 2004 Haumanu, a collective of makers and performers of taonga puoro, held a wānanga (house of learning) at Hei Tiki Gallery, Rotorua, organised by Ngawara Gordon. Attending the wānanga was John Purser of the Isle of Skye in Scotland, a leading figure in the revival of traditional Celtic instruments. Tutors of Irish and classical flutes also took part. 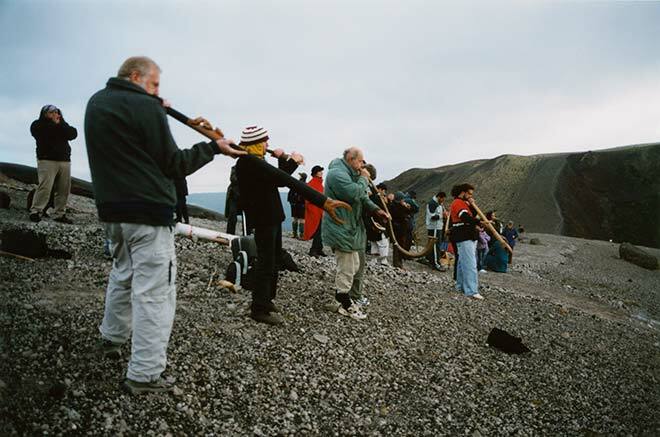 This photo shows a dawn performance by wānanga participants on the summit of Mt Tarawera, in which Purser's brass horns were played along with the pūkāea and pūtātara. The event continued the practice Hirini Melbourne had established of consulting with local iwi members and playing in significant places.